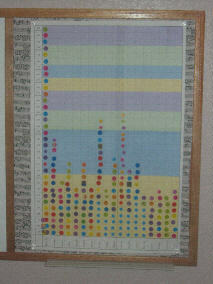 The trophy chart was my studio incentive last year, and since it was such a big hit, I am doing it again. Students earn points for each day practicing, telling me the fact of the week for the composer of the month, learning scales and technique, memorizing, composing, participating in the local MTA events, etc.For every 25 points, the students get a sticker on the chart. When they get to the top line of a color, they earn a trophy that is the same height. Students love to watch their trophies “grow” throughout the year, and they can see how tall the trophy actually is. As an added bonus, although students are only competing against themselves, there is huge motivation in seeing how their progress rates against the other students in the studio. I print 2 copies of the chart, then cut and tape them together for the finished product. I order the trophies from Crown Awards – great prices, products, customer service, and fast shipping.